Sustainable Farming Practice With Peace of Mind! Known as the Winter Garden, this long outdoor run, typically located on the south or leeward side of the barn, allows the hens access to fresh air and sunlight. This ‘screened-in porch’ provides protection from predators, while controlling driving wind, rain and snow – still allowing natural light and air to ingress. After their first visit, hens make daily trips to the Winter Garden to satisfy their natural desire for sunlight. The Winter Garden Curtain provides the best environment possible during these visits, while maximizing production and minimizing health concerns. 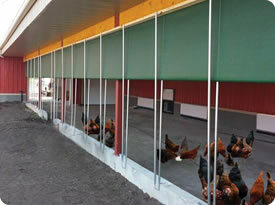 Typically used to provide a transition area between the barn and yard, Sun-North’s Winter Garden Curtains can be raised and lowered as desired. Our curtains will help satisfy certain criteria for organic and other premium industry standards.